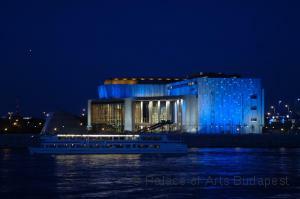 The Palace of Arts building was opened in 2005, next to Danube river and part of the Millennium City Centre of Budapest. It incorporates a concert hall, the Festival Theatre and the Ludwig Museum as well. Two lighting systems can be used for the Media Facades Festival: the LED lights strips and the headlamps around the building which are operated by two different computer systems but can be used simultaneously. The lights are attached in groups to the building‘s facade (horizontal and vertical). Their colour and intensity can be changed group by group.